Article first published as New Apple Macbook 15" Model Specs and Rumors on Technorati. Apple's best product around the world is Macbook. Day by day Macbook is taking higher position in the category of laptops. It's hardware and software has taken Macbook to the top most position. Apple have launched Mackbook's different models (Mackbook Pro and Macbook Air). 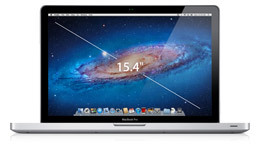 Apple is going to launch Macbook's new model of 15 inch in march 2012. It may be put in the category of Pro or Air but yet not declared.